"Moose Blues" came to fruition after Teshia envisioned a moose painting that married the abstract colorization of two of her most popular paintings "Moose Drool" & "Motley Moose" with the earthy hues & manginess of a true moose. The outcome resulted in a contemporary composition that embodies realism with surrealism, while maintaining the vibrant energy & life that her wildlife paintings are so notorious for. 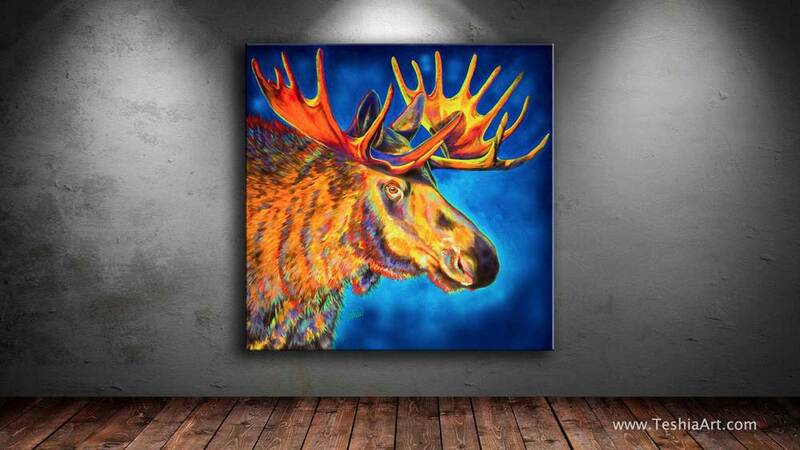 The Original Moose Blues painting reveals hints of electric metallic paints infused with Teshia's radiantly bold colors & illuminating lines. He is a handsome bull, with a deep gaze in his eyes & an elusive soul.